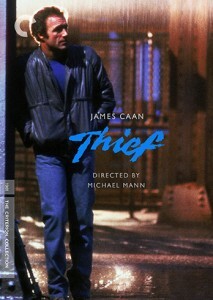 Criterion’s new Blu-ray edition (Blu-ray/DVD Combo actually) of 1981’s Thief, Michael Mann’s (Collateral) first feature, is set in Mann’s home city of Chicago, a dark and rainy place that comes to neon life at night when a master jewel thief named Frank (James Caan, Middle Men) plies his trade. Using drills, electronics, welding lances and other high-end tools of the trade, Frank ain’t no smash-and-grab robber—he’s a driven, adept pro. Having done more than a decade in jail for some petty theft years earlier, he learned his trade in the clink and now that he’s been out for several years and making some solid bucks, he wants to take down one more big score and then get out of the business to live the kind of life he’s clipped out of glossy magazines. If only there weren’t so many distractions—by a crime lord (Robert Prosky) that wants him on his payroll, a city full of corrupt cops, a jailed mentor (Willie Nelson) with a heart condition, and a lovely ex-party girl (Tuesday Weld, Once Upon a Time in America) who Frank needs to complete his perfect couple fantasy. If only he can swing that one final score without everyone trying to take a bite out of him and his bounty. 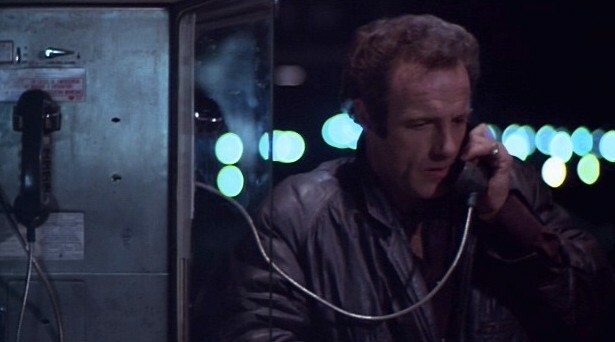 James Caan makes the call in Thief. Mann comes to his first film wielding his signature visual style, and the film looks simply stunning, particularly the many nighttime sequences. The rain-slicked streets, the neon bar signs, the headlight-lit fog—it’s all used to top effect here, atmospherically enhancing Frank’s story and his quest for a “normal” life. The sound and vision delivered by the Blu-ray is top-notch and truly a sterling example on Blu-ray promise to serve up a film that was it was meant to be consumed! 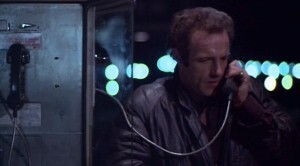 Along with the archival 1995 audio commentary with Mann and Caan, there are only a few new bonus features in the form of a trio of newly recorded interviews with Mann, Caan and musician Johannes Schmoelling of the band Tangerine Dream, the creators of Thief’s memorable synthesizer score. In his 25-minute sequence, Mann talks about the research he conducted on convicts and ex-cons at Folsom State Prison (he was there working on an early uncredited writing project, Straight Time, and for his acclaimed 1979 TV film The Jericho Mile), as well as the process-obsessed, nearly mechanical approach Frank has to his career and life. For his part, Caan declares that Thief is one of the films he’s most proud of, and that his collaboration with Mann remains one of his finest work experiences. Remembering his experiences of dealing with real-life thieves, safecrackers and law enforcers, Caan clearly enjoyed himself during the production, where he performed all his own thievery. “I got really good at safecracking,” he laughs.